Sand Under My Feet: [INTERNATIONAL GIVEAWAY] My Echopaul.com Wishlist and $30 Gift Card Giveaway! Echopaul.com, is an online shopping portal for women's clothing, men's clothing, boys clothing, girls clothing, baby clothing, women's bags, men's bags, school bags, women's shoes, men's shoes, boys shoes, girls shoes, baby shoes, and hair accessories hair tools, etc. Free shipping worldwide with no minimum order. Cool huh? And now the good news! 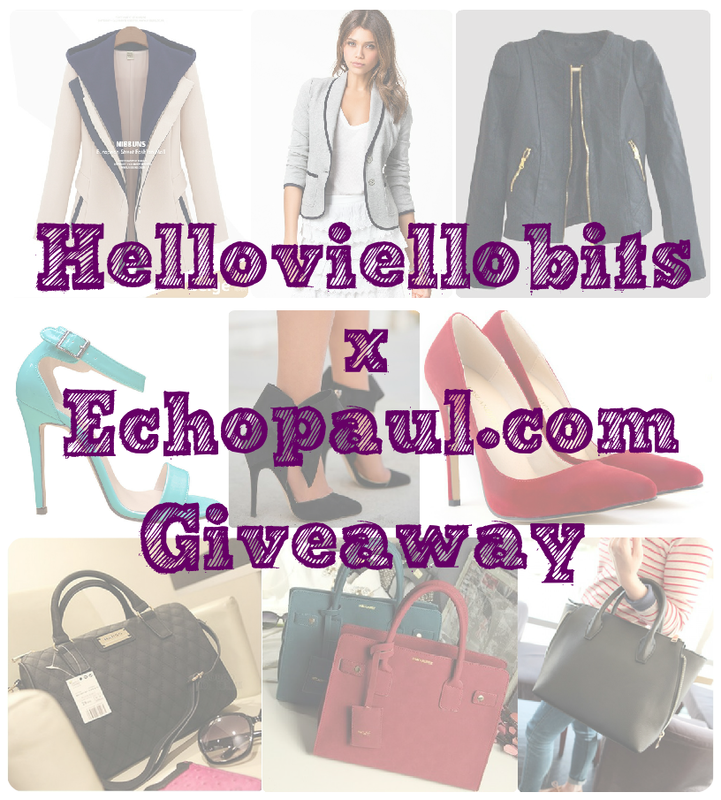 Echopaul is sponsoring a giveaway for my readers where you can win a $30 Gift Card that can be use to shop at Echopaul without minimum order amount and free shipping! Awesome right!? 1. PLEASE READ THE RULES/STEPS CAREFULLY. 2. Like Echopaul on Facebook Page. 3. Post/Share your favorite item from Echopaul or from the items I posted above on your Facebook wall (don't forget to include in the post the link/url of the item). 4. Follow Echopaul on Pinterest. "I hope to win and my favorite item is https://www.echopaul.com/vintage-leather-shoulder-bags-messenger-bag-handbag-totes.html"
7. Like Helloviellobits on Facebook. 8. Add Helloviellobits on Google Friend Connect/GFC. Look for the GFC widget which is on the left side of my blog. 9. Follow Helloviellobits on Google+. 10. Follow Helloviellobits on Instagram. 11. Share this giveaway on your Facebook wall, invite and tag 3 of your friends. (Don't forget to put it in public mode so I can verify it). So here's the Rafflecopter widget, just follow the steps, it's that easy! This giveaway is OPEN WORLDWIDE and starts on October 19 and will end on November 2, 2014 (3 weeks only! So hurry and join now!) Selection of winner will be via Rafflecopter. Make sure that you follow the steps, because I'll be verifying the entries. Those who won't will be disqualified (sorry...) I will announce the winner of this giveaway on my Facebook Page and in this post a few days after the contest ends. I hope to win and my favorite item is https://www.echopaul.com/vintage-leather-shoulder-bags-messenger-bag-handbag-totes.html"